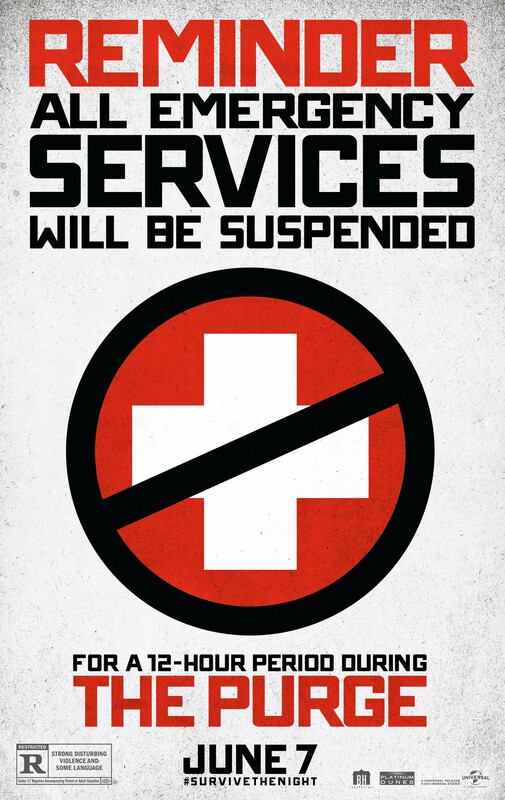 There’s a fairly interesting concept at the heart of The Purge. Set roughly ten years in the future, crime in America is at an all-time low, the unemployment rate is a measly 1%, and murder is almost nonexistent. The reason? One night a year, for 12 hours, all crime (with a few caveats) is legal; law enforcement and emergency services are suspended from 7 PM to 7 AM the next morning. This night, called Purge night, is designed to allow American people a cathartic release; a way for people to “get it all out of their systems” and be law-abiding, productive members of society for the rest of the year. This basic premise is an interesting one and could have provided the opportunity to tell a challenging morality story. Unfortunately the film never takes the premise as far as it could potentially go, instead opting to go much more shallow. The first half of the movie isn’t bad, actually; it goes for more of a thriller angle with the core conceit stated right up front and the stakes of the narrative gradually escalating from there with a few twists and turns along the way. It introduces the concept of the Purge by showing a string of news stories and interviews discussing the “merits” of the event juxtaposed against silent security camera footage of people brutally murdering each other on various Purge nights. This is also when the film sets up the idea that, despite all the supposed societal benefits of the Purge, the true purpose may be a way for the government to exterminate the poor, the unemployed, and the homeless – the people who aren’t “contributing” to society. While the wealthy can afford to protect themselves with expensive security systems and buy weaponry to participate in the Purge, the poor are left relatively defenseless. This is the film’s big idea: the literal killing of the lower class at the hands of the wealthy. It’s more than a little ham-handed and it’s really not so much a political allegory as it is a literal extreme of a societal trend, but at the same time it’s timely and it works in its own blunt, inelegant way. This is all further reinforced when we meet the “heroes” of the story. James Sandin is a sales person for home security systems – which, as you might assume, are in high demand – and he and his family live in a large house in an upscale suburb. Though he doesn’t actively participate in the Purge, the Purge is responsible for his livelihood and he openly supports it. As his family locks down their home for the evening they gather around to watch the footage from night’s “events.” However, Sandin’s son Charlie, who is conflicted at best about the whole situation, quickly dismisses himself. Later that evening Charlie hears a homeless man outside their home calling for help; Charlie has sympathy for him and shuts off the security system long enough to let him come inside. Soon afterward a group of young Purge participants descend up on the Sandin home explaining that this homeless man was their mark and if the Sandin family does not release him they will break into the Sandin’s home and kill them along with the homeless man. While there are flaws – particularly a distinct lack of subtlety – the early part of the film works well enough. Where most of the film’s strengths lie is in the building of tension during the first half of the film. With the concept of the Purge explained an unease looms over everything, whether it’s a seemingly pleasant conversation with neighbors, or a family dinner as a clock in the background ticks closer and closer to the start of the Purge. Unfortunately, though, the film can’t manage to sustain this. It slowly begins to abandon its efforts as a thriller and instead descends more and more into the realms of a low-rent slasher flick. Character actions become increasingly nonsensical and events in the film begin happening for no other reason than to adhere to horror movie tropes. The mob outside the house, despite wanting the family to find and turn over the homeless man, cut the power forcing them to search around in the dark. Family members refuse to stick together, instead opting to run off to various locations in the home for no reason whatever. On top of this, the leader of the mob waiting outside their home plays his character with a vaguely Heath Ledger’s Joker-esque quality which could have been a lot of fun in a different film, but in this one is yet another example of the film fundamentally struggling to find and stick with a tone. That being said, there’s one moment about midway through the film that really sells the core struggle of this idea in a way that the whole movie ideally should have. Despite knowing what is objectively right, you really feel for the characters’ situation in a way that makes it very challenging. It successfully conveys the conflict of the situation in a really great way, and it’s the film’s definitive high point. Unfortunately it doesn’t last long, and the movie is all down hill from there. While horror movie tropes crept in slowly but surely during the beginning half of the film, there is a distinct and dramatic shift in tone once the mob enters the house. Here all pretense of being an intriguing and thematic thriller go out the window to make way for what’s ultimately a pretty lousy slasher. What was interesting to me is the way the audience responded to this. I’ve read quite a few critics commenting on how audiences in their theater laughed and cheered for the violence in the later half of the film despite the film clearly trying to use the violence to make a disturbing and semi-realistic point. However, the way I see it, the filmmakers utterly failed to carry that intent through to the second half of the movie. The film itself changes into a B-grade horror movie and audiences react accordingly. The jarring tonal shift shatters any intrigue or suspense that might have been established in the first half and all that’s left to do is laugh at poorly constructed scenes of violence. Changing the tone of a film is an extremely dangerous thing to do; some films can manage to pull it off, but more often than not it only serves to break an audience out of their suspension of disbelief and completely disconnect them from the experience. It’s something that your average audience member won’t necessarily pick up on but they’ll feel the effects. They’ll be snapped out of the fantasy of the film, but they won’t really know why and so they’ll start picking up on surface details to blame. Film Crit Hulk calls these “tangible details,” and to be sure I heard a whole plethora of amazingly varied complaints walking out of the film, almost none of which got to the heart of the film’s problems. Whether by fault of the filmmakers or the studio, this film doesn’t know what it needs to be to pay off on the promise of its central idea and instead flounders around trying to find what kind of movie it wants to be. It starts out trying (though not always succeeding) to be something more topical and intelligent, but then descends into a dumb mess of horror film clichés. Personally, I find the whole second half of the film indulgent and utterly unnecessary and a smarter, bolder move would have been to allow the characters’ internal conflicts be the main through line of the film with the consequences of their actions (or lack thereof) being played out in the finale. Instead it rushes through all of the film’s most interesting ideas so that it can get to the killing. There’s a smart movie that could be made from this idea, but The Purge isn’t that movie.